I present to your attention the connector for the cable 8D-FB. Over the past few coaxial cable 8D-FB has become very popular in the world. Until recently, this cable was viewed as a novelty and preferred to take something familiar. At the moment the picture has changed. Radio amateurs are willing to buy an 8D-FB cable for their needs. The cable goes both with a fully copper central core, and aluminum copper-coated. The diameter of the central core is 2.6 mm. The diameter of the outer shell is 11.1mm. With an aluminum central core, the cable has a light weight, which allows it to be suspended without a supporting cable. The cable has good technical characteristics, low attenuation. One downside is that it’s hard to find good connectors for 8D-FB. There are practically no connectors. 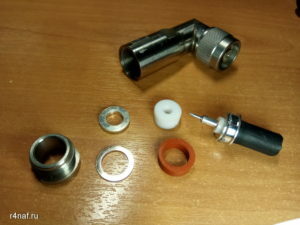 And the fact that there is – a very cheap fake branded connectors. 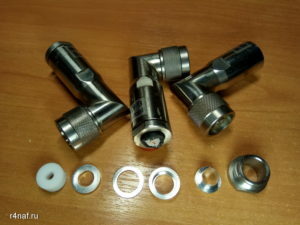 The photos below show N-MALE N-LP-8DFB Stainless Steel proprietary connectors for the 8D-FB or RG-8 cable. 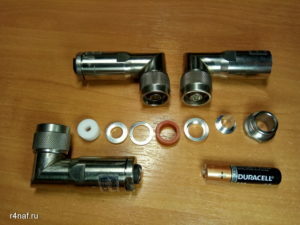 The connectors are second-hand, but in excellent condition. One connector weighs about 160grams. 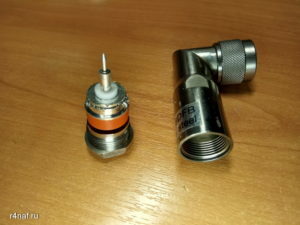 This entry was posted in Radio news and tagged 8D-FB, coaxial cable 8D-FB, N-LP-8DFB Stainless Steel, RG-8, Кабель 8D-FB, коаксиальный кабель 8D-FB, Разъёмы 8D-FB, сable 8D-FB, сonnectors 8D-FB. Bookmark the permalink.